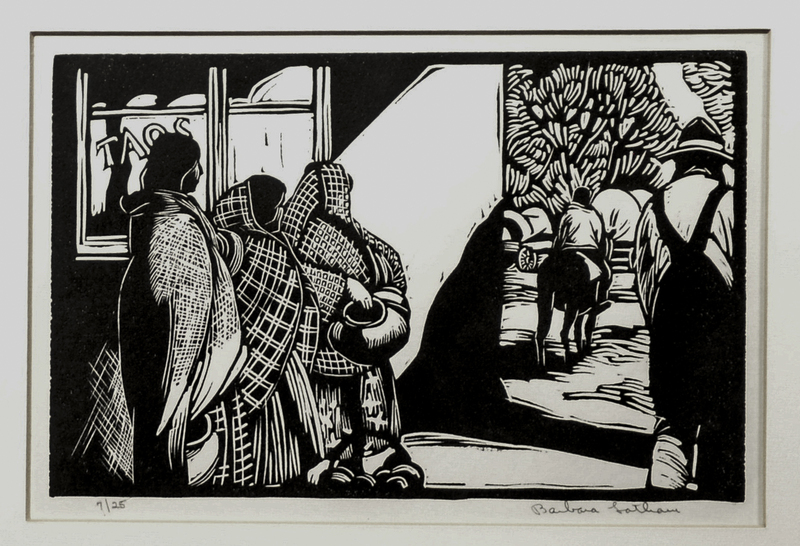 Latham, from the time of her first visit to Taos, created prints and paintings of New Mexico subjects: the Taos landscape, views of the town and genre depicting the seasons of rural life including that of the Taos Indians. She also illustrated children’s books and did pencil drawings. Latham’s illustrations for children’s books included Pedro, Nina and Perrito, 1939, and Maggie, which was chosen as one of the best books from the period of 1945 to 1950 by the American Institute of Graphic Arts. A lithographer and etcher, she created wood engravings that have an intense, contrasting use of black and white. Latham’s art became darker and moodier, somewhat surrealistic, after World War II. She died in 1989. Among Barbara Latham’s one-woman exhibitions are the Witte Memorial Museum, San Antonio, Dallas Museum of Fine Arts, Roswell Museum, New Mexico and Weyhe Gallery, New York City. Her work is in the collections of the Philadelphia Museum of Art, Metropolitan Museum of Art, New York City, and Library of Congress, Washington, D.C.